I like to spend my afternoons at home, catching up on work that needs my concentration, doing what needs to be done in the kitchen and watching the TV shows on the PVR that Dave does not watch. If the weather is good I like to go for a walk on the beach. In the middle of winter we had a day when it was 25°C and I took the dogs with me. Little did I know it would lead to a disastrous week for Dave. I left the Wednesday after the walk for a business trip and the same day Molly went walk about. By the time the following Monday came around, both Patch and Molly were taking themselves off for a walk. On the Monday night, Molly got out and she was not found until lunch time on Tuesday. I was beside myself with worry. Patch went looking for her and got found at the pub being fed biltong. On Tuesday Patch got out again and was found on the beachfront and so the two of them had a sleepover at a friend’s apartment as Dave had flown up to JNB to see his Mum. Dave has dog proofed every place he can see and I am hoping that the running away will stop, as I really want to be able to walk with them in the afternoons. I want to be able to have easy dinners, like this one, after a beach walk. I don’t want to lock them in the house and have crazy dogs each night and I want to go out sometimes without them and without worrying about a phone call. I can’t believe I missed this tasty pasta dish. And that was quite an adventure with the dogs. Hope it’s all calmed down by now. 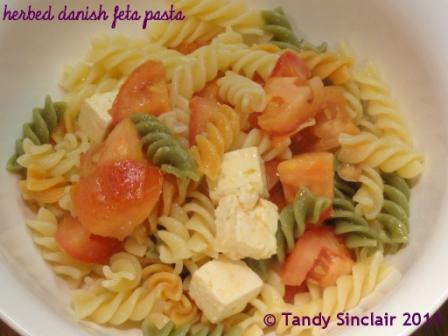 A treat of spiral pasta…love the easiness of this pasta dish and the flavours..I’ve been indulging in marinated feta too this week…I’ve had a no meat couple of days! Hitting Spring again I’ve got to think thin! LOL! I cannot believe spring is here already! I love making pasta when I’m looking to make something easy. Your pasta looks and sounds wonderful. This pasta sure does sound easy and delicious! Hopefully your dogs can stay put long enough for you to enjoy your meal! I think a herd dog would be a great idea! Seems your fur children are testing their boundaries and with biltong and the beachfront out there, their appetites for exploring have expanded!